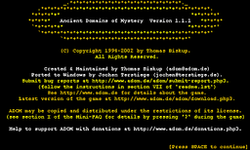 Ancient Domains of Mystery is a freeware, roguelike game written by Thomas Biskup and is available at the official ADoM website for Windows, Linux, and many other operating systems. It takes place in the Drakalor Chain on the planet Ancardia. A Chaos Gate has been opened by Andor Drakon, the ElDeR cHaOs GoD. It was first discovered by the sage Khelavaster, who tried to close it but disappeared. Now Chaos beasts are roaming Ancardia. You are one of the many hero(ine)s who seeks to defeat Chaos and restore peace to the world. The easiest way to defeat Chaos is to close the gate. However, a holy champion of order or balance, if equipped with certain unique artifacts, may instead enter it, slay Andor Drakon, become a demigod and keep Ancardia safe from Chaos for evermore. Those who have turned to the dark side may also slay Andor Drakon in hopes of becoming a more powerful Chaos God - perhaps even an Ultimate Chaos God. This page was last edited on 5 May 2009, at 02:08.